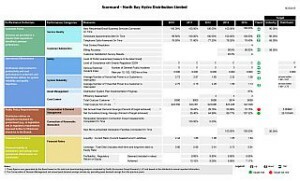 The Ontario Energy Board (OEB) has developed a scorecard for all local distribution companies across the Province as a tool to allow customers to gain a better sense of how well their utility is performing over a 5 year period (2010-2014). The scorecard includes traditional metrics for assessing a utility’s services, such as frequency of power outages, financial performance and costs per customer. 2014 onwards include a number of metrics that directly reflect the customer experience, such as how well the utility resolves a customer’s concern on the first contact, the accuracy of customers’ bills, public safety and more. The OEB has developed an FAQ that includes tips on how to read the scorecard. Please click here to view NBHDL’s published scorecard and the OEB’s FAQ. Technical and plain-language descriptions of all scorecard measures can be found on the OEB website; the link can be found within the OEB’s FAQ.